Puss'N Boots has 20 pay lines with 5 reels and 3 rows and starts with the card icons represented pictorially rather than with letters. The theme symbols are all part of Puss's attire, the Swords paying 15x bet for 5-of-a-kind, the Boots 10x, the Hat 6x and the Gloves 4x. All the card suit icons pay 25.x stake for the full line. Puss himself forms the game's Wild which appears fully stacked on all reels as do the theme symbols as described above. Wilds pay 50x bet for 5, therefore you would be in your own pantomime if a full screen came in as you would collect Golden Guineas in the form of 1000x stake! As with most Red Tiger slots such as Lucky Easter and Lion Dance, the central character may appear on any spin and award one of four random in-play features. Puss'n Boots may swap losing reels around to create a win or increase a smaller one, he may award a winning combination paying at least one 5-of-a-kind win, can change the reels to have only the premium symbols on them and lastly may even 'swap tiles' and change a random amount of low symbols into the same premium one. These occur frequently and can produce some moderate wins, although the best is saved until last! Puss is very generous in the bonus free spins. 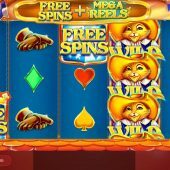 On all reels you have a scatter formed with Golden Crown and any 3 or more in view will trigger some quite rewarding free games. You choose from 3 different coloured icons, which are green, blue and red. This will decide the amount of free games which range from 5 to 15 and also every single one of them will have allocated one of the 4 in-play features described above. So for example you may be awarded 10 spins with 'swap tiles' as the enhancement for each one which in my view is the most rewarding as nearly all spins will give multiple 4 or 5 premium symbol wins. You will also notice that there may not be a retrigger possible as scatters are removed, but some tiles are overlaid with +1, +2 or +3 spins awards!